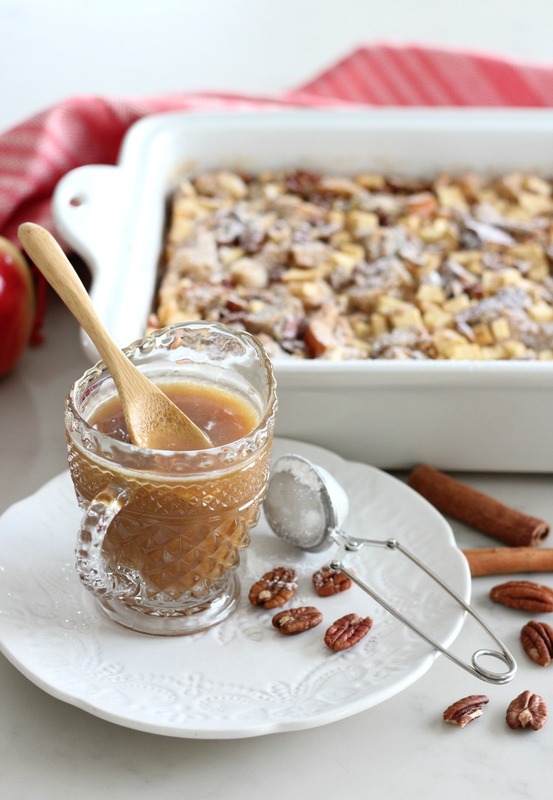 Apple Cinnamon Multigrain Bread Pudding is a fall recipe perfect for the holidays too. Delicious apples, hearty bread and cinnamon-infused custard make this dessert the ultimate comfort food. This post is sponsored by BC Tree Fruits. I have been compensated monetarily for my time and recipe creation. 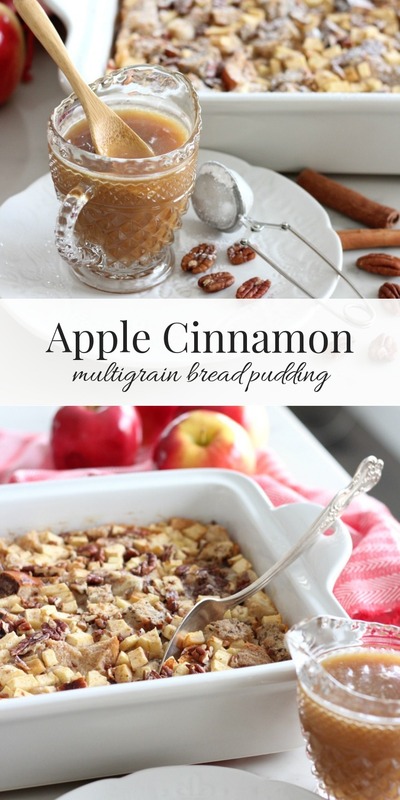 This apple cinnamon multigrain bread pudding recipe, the pictures and words are my own, as always. Hello all! I’m happy to be back again sharing a delicious recipe inspired by fresh fruit grown in the sunny (and sometimes rainy) Okanagan valley of British Columbia. Last time around, Summer peaches were the star. Now, it’s all about the Fall season with sweet and crisp Ambrosia apples. When my box of BC Tree Fruits Ambrosia apples arrived at my door, I knew exactly what I should make. Of course, I couldn’t resist immediately trying one on its own. Aren’t they pretty? Oh, how I love the sweet, white, firm and crisp flesh of an Ambrosia apple. A nourishing and healthy snack, indeed. But did you know they’re also a great choice for salads, pies, and baking? Of course, I went for the baking option. 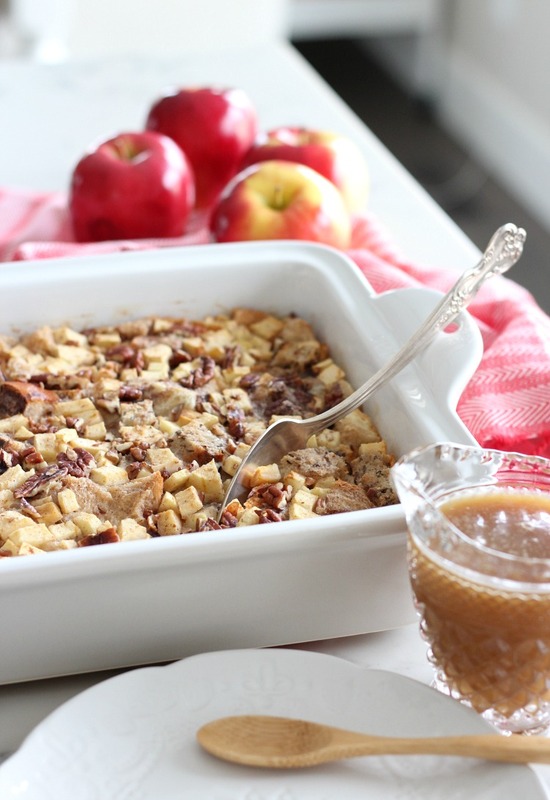 It seemed only natural to combine my love of all things apple cinnamon with one of my favourite desserts, bread pudding. 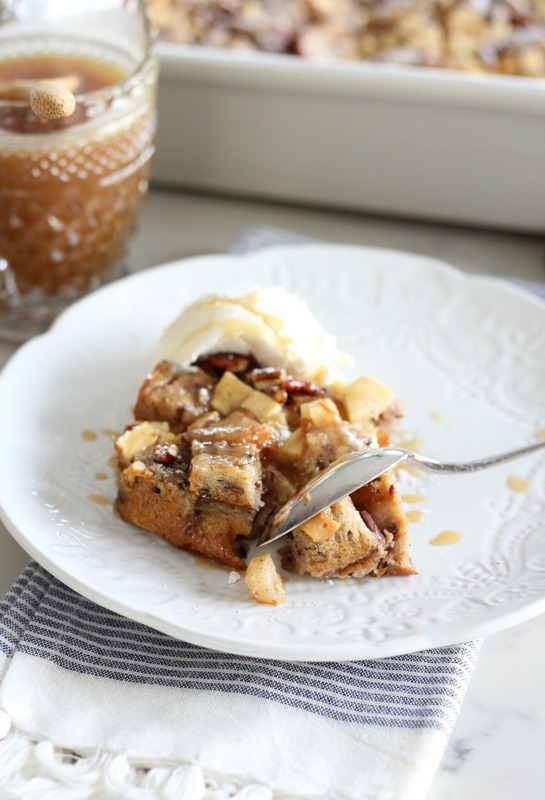 Let’s just say I’ve tried my fair share of this scrumptious treat over the years (including this banana bread pudding), and this apple version is right up there with the best. Don’t take my word for it, though. BC Tree Fruits grows over 12 fresh apple varieties, which means you’ll have plenty to select from. At the grocery store recently, I noticed gigantic boxes of Honeycrisp, Fuji, Golden Delicious, Royal Gala and more. All are excellent for making desserts, so don’t worry if you can’t find Ambrosia. Be sure to look for the sticker Leaf when buying apples to ensure they are premium quality and sustainably grown. Ready to make this delicious dessert? 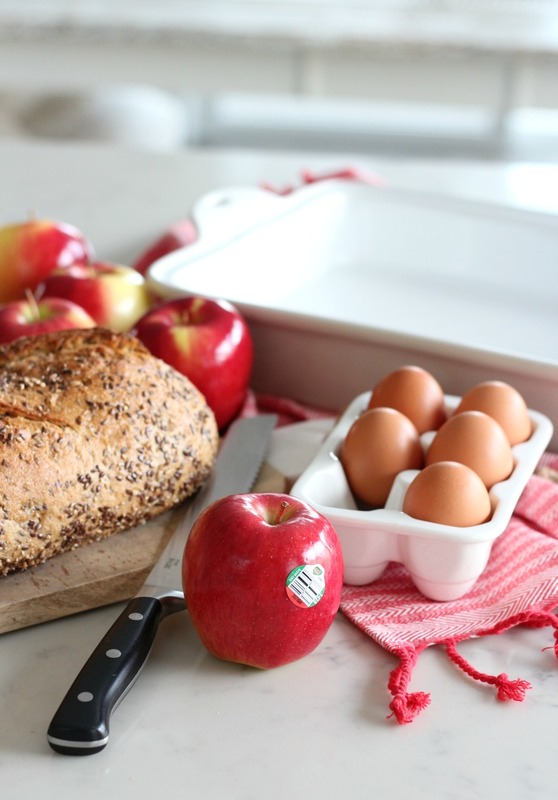 Once you’ve selected your fresh apples, swing by the bakery section and pick up a good quality multigrain loaf. The one I used is artisan style with flax seeds, sunflower seeds, rye and more. I also grabbed a loaf of basic French bread to mix in to keep the pudding from being too dense (about 2 cups worth). 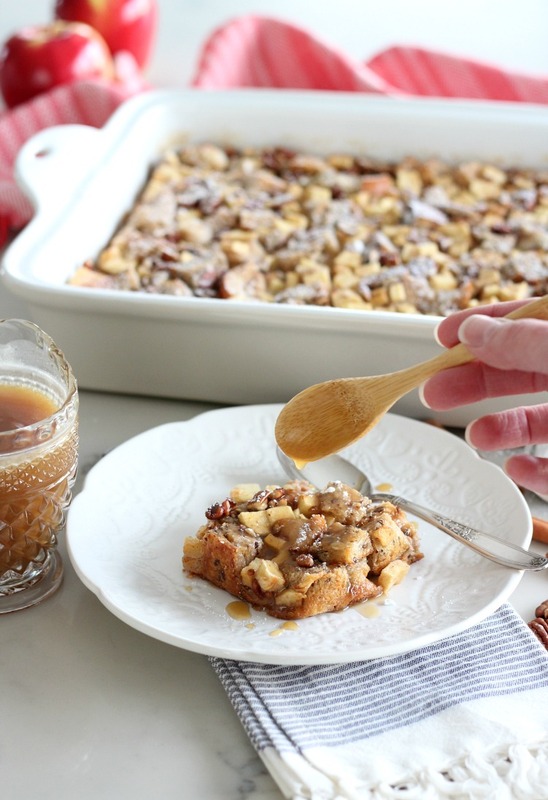 To make this bread pudding, you’re also going to need butter, pecans, eggs, milk, vanilla, cinnamon and brown sugar. Basic ingredients that come together in harmony. Ahhh…. I peeled my Ambrosia apples and chopped them fine. Of course, leaving the skin on means more nutrients. Go that way if you’re wanting a bit more rustic dessert. After topping the bread, apple and pecan layers with the custard mixture, press down gently with a spatula and allow it to hang out for a bit. The bread will soak up all the goodness before baking. Now, get ready for your kitchen to smell amazing! Baking is where the magic happens. Some of the bread gets crispy, while other parts become soft and creamy. The sweet crunch of the apples along with the cinnamon flavour is totally divine. And, those seeds and nuts add just the right amount of texture. Yum! Allow the bread pudding to cool a bit, then give the whole thing a light dusting of powdered sugar for a festive look. A tea infuser wand works well if you don’t have a shaker or small sifter. Serve this bread pudding warm. The salted caramel sauce is optional, but who am I kidding? That stuff is totally irresistible! On a side note, you could just whip up a batch to dip freshly cut apple slices into. And, of course, take it over the top with a scoop of vanilla ice cream. HELLO! 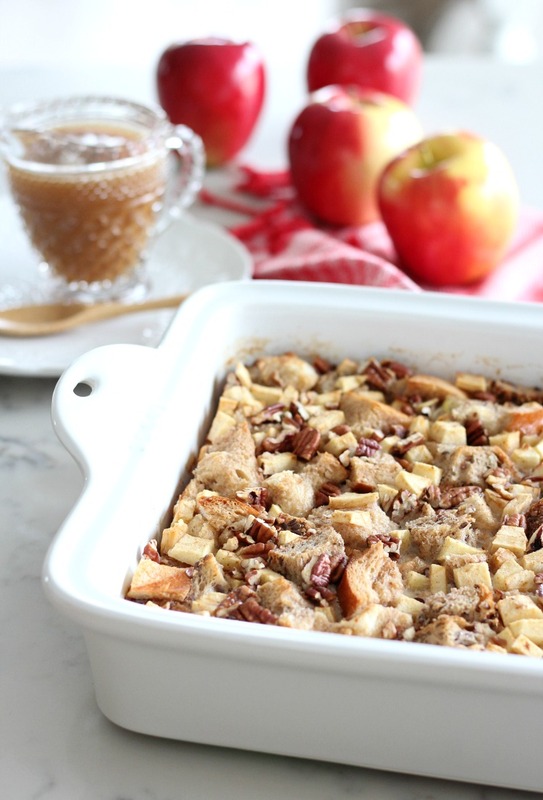 Be sure to add this apple cinnamon multigrain bread pudding to your holiday baking list whether you’re entertaining at home or on dessert detail. 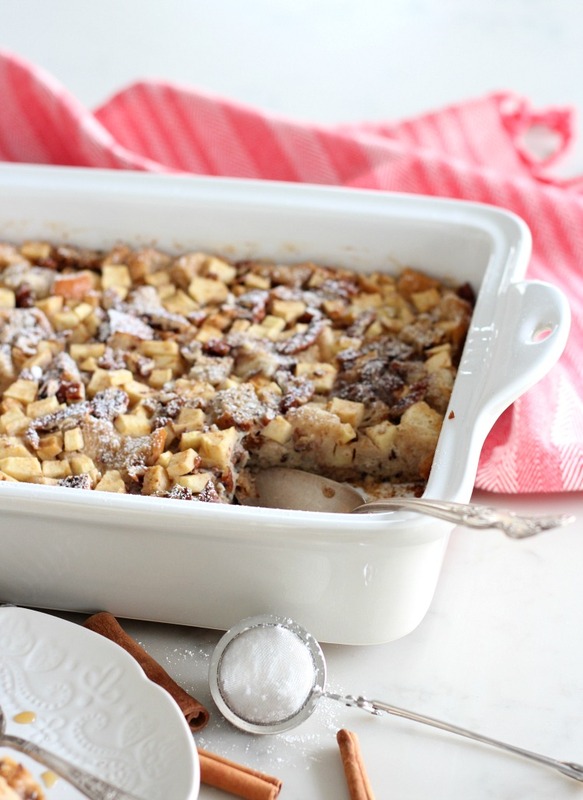 This bread pudding transports well and keeps in the fridge for at least for a few days. Or, pop it into the freezer. Simply reheat and serve. Great recipe for brunch too! Delicious apples, hearty bread and cinnamon-infused custard make this dessert the ultimate comfort food. Preheat oven to 350°F. Generously butter a 9 x 13 deep baking dish. Layer bread on the bottom of the prepared baking dish, followed by the apples and pecans. In a large measuring cup or bowl, mix eggs, milk, vanilla, cinnamon and sugar until smooth. Pour the wet mixture over the layers, making sure to evenly coat the bread. Press down with a spatula and let rest for at least 5 minutes or until most of the liquid has been absorbed. Cover loosely with foil and bake for 45-50 minutes (removing foil after 10 minutes). The bread pudding is done once the top is golden brown and the egg mixture is set in the middle. Allow to cool for a bit before serving. Top with powdered sugar, salted caramel sauce (see below) and a scoop of vanilla ice cream (optional). Add butter and stir until completely melted and bubbly (about 2 minutes). Slowly pour in heavy cream until it comes to a boil, stirring constantly. Remove from heat and add salt. Pour over bread pudding while still warm. I used fresh bread for this recipe (6 cups multigrain and 2 cups white). If using bread on the drier side, you may need to cut back the amount or increase the custard mixture. 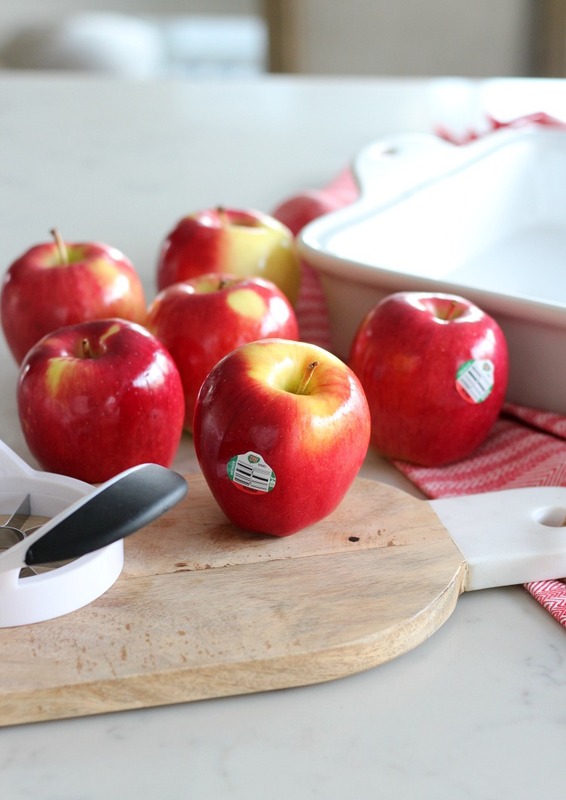 Store apples in your refrigerator crisper drawer set at a low temperature and high humidity. Apples emit ethylene, a naturally occurring gas that encourages ripening, so keep them in a plastic bag to prevent them from speeding up ripening of other produce. Apples are easier to peel when they’re cold. Keep in mind, most of the fruit’s remarkable nutritional value is found in the skin! Use a plate of apple slices on the kitchen counter to help absorb cooking odours. Looks so delicious! These apples are one of my favorites – so juicy and sweet! My mother introduced me to bread pudding for the first time last year. It’s awesome and we need to try this one.